How Much CSF Should Be Removed to Alleviate Post-Lumbar Headache in Patients with Idiopathic Intracranial Hypertension? A retrospective study found that removing less cerebrospinal fluid in patients with idiopathic intracranial hypertension after lumbar punctures may be optimal to alleviating post-lumbar puncture headache. The study authors offer a clinical formula for reaching optimal high-normal pressure. Can calibrating the amount of cerebrospinal fluid (CSF) removed during a lumbar puncture (LP) in patients presenting with idiopathic intracranial hypertension (IIH) diminish the occurrence of post-LP low pressure headache? A retrospective analysis of a series of patients at a single institution undergoing low-volume CSF removal for IIH (also referred to as pseudotumor cerebri) suggests it can. In the new study, published in the February 18 online edition of the Journal of Neuro-Ophthalmology, investigators reported that optimal “high-normal” closing pressure—approximately 18-20 cm H20—may result in symptom relief and a lowered frequency of post-LP low pressure headache. Moreover, the report offers a clinically useful formula for reaching optimal high-normal pressure based on an observation that for every 1 milliliter of CSF removed, the CSF pressure drops by about 1.5cm H20. “We believe that by removing less CSF you are less likely to have patients present for severe low-pressure pain in the week after the procedure,” said lead author Michael D. Perloff, MD, PhD, director of pain medicine at Boston University Medical Center. Experts who reviewed the report agreed that it addresses a substantial clinical problem associated with assessing patients for pseudotumor cerebri: Approximately 30-40 percent of patients experience post-LP low-pressure headache that can be, in some cases, severely debilitating. And it calls into question the practice, based on standard clinical dictum, of removing as much as 30 mL of CSF. But the independent reviewers said there may be other methods to reduce the frequency of post-procedure headache, and at least one expert said there may be no correlation at all between volume of CSF removed and subsequent headache. Dr. Perloff and colleagues conducted a single-center retrospective analysis from 2011 to 2016 of 125 patients who underwent fluoroscopic LPs for IIH. They hypothesized that patients with IIH undergoing LP may achieve headache relief with a lower incidence of post-LP headache with the “high-normal” closing pressure (CP) goal of 18-20 cm H2O. All LPs were performed under fluoroscopic guidance using a 20-guage Quincke needle with the patient in the prone position. Post-procedure phone calls were made to the patients four to seven days after the LP, a practice that is standard at Boston Medical Center. Follow-up clinic visits were also reviewed by an evaluator who had not seen the patient to determine if headaches were suggestive of intracranial hypotension. Patients were classified with regard to post-procedure headache as improved, worse, or unchanged. The average closing pressure was 17.9 cm H2O; the average per volume CSF removed was 9.7 mLs. Sixty-four percent (n=80) of patients reported that their headache was improved, including 11 who said they were headache-free. Headache was worse in a total of 33 patients (26 percent); eight of whom were seen in the emergency department, and three of whom were admitted to the hospital. A blood patch was performed in one case. In an interview with Neurology Today, Dr. Perloff acknowledged that the retrospective nature of the study and lack of a comparator arm were limitations, but he said the results offer a clinically useful guide for clinicians seeking to prevent post-LP low-pressure headache. Observing that CSF pressure drops approximately 1.5 cm H20 per milliliter removed, he offered a formula by which a high-normal closing pressure can be achieved for individual patients: Whatever the desired goal pressure difference between opening and closing pressure should be multiplied by two-thirds, as a clinical guide for how many mLs of CSF to remove. Dr. Galetta, who is an associate editor of the Journal of Neuro-Ophthalmology, said the report offers a valuable examination of the role of closing CSF pressure in the control of headache in the first week following LP for IIH. Victoria S. Pelak, MD, FAAN, professor of neurology and ophthalmology and director of the Neuro-Ophthalmology Fellowship at the University of Colorado, said there are alternative instruments that can be employed to diminish the frequency of post-procedure headache, and suggested that closing pressure may be a negligible factor. Dr. Pelak recommended when using a cutting needle to keep the bevel parallel to the long fibers of collagen in the dura to prevent a “tear” and leak. “The CSF is replaced (500 mL produced daily) so quickly that the removal seems less important than the tearing of the dura,” she said. Grant Liu, MD, FAAN, professor of neurology and ophthalmology at the University of Pennsylvania and one of the team that developed diagnostic criteria for IIH, said he believes there is no correlation between closing pressure, amount of CSF removed, and frequency of post-procedure headache. In a report last year in Pediatric Neurology, Dr. Liu and colleagues analyzed data on 93 children receiving LP for IIH and found no significant association between closing pressure, amount of CSF removed, and time to resolution of papilledema. Specifically, there was no significant difference in children above or equal to and those below a median closing pressure 170 mm of cerebrospinal fluid, or a median volume of 16 mL CSF removed. Moreover, there was no statistically significant difference detected in days of headache between the children with opening pressure above and equal to the median of 400 mm of cerebrospinal fluid, and the children with opening pressure below the median. “For clinicians the bottom line may be that high-volume removal of up to 30 mL may be unwarranted, but more research will be required to elucidate the variables that correlate with post procedure morbidity,” he said. Drs. Perloff, Galetta, Pelak, and Liu reported no competing interests. •. Perloff MD, Parikh SK, Fiorito-Torres F, et al Cerebrospinal fluid removal for idiopathic intracranial hypertension: Less cerebrospinal fluid is best https://journals.lww.com/jneuro-ophthalmology/Abstract/publishahead/Cerebrospinal_Fluid_Removal_for_Idiopathic.99178.aspx. J Neuroophthalmol 2019; Epub 2019 Feb 18. •. Beres SJ, Sheldon CA, Bolsvert CJ, et al Clinical and prognostic significance of cerebrospinal fluid opening and closing pressures in pediatric pseudotumor cerebri syndrome https://www.pedneur.com/article/S0887-8994(17)31078-0/fulltext. Pediatr Neurol 2018;83:50–55. 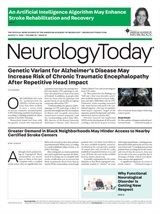 Neurology Today19(7):22-23, April 4, 2019. Which are the Most Efficacious Therapies for Nonmotor Parkinson Disease Symptoms?